Howdy from high-atop the deck at Mountain Vista! It’s a stormy day in Beavers Bend and we love watching the weather roll in from our 50-mile western view. June is filling up fast. We only have a handful of days still available. Book your Broken Bow luxury cabin dates soon for the summer months. 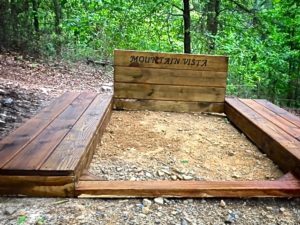 We’re installing a cool new horseshoe pit at Mountain Vista. As always, we’re not charging you a resort fee for this! We’ll have more horseshoe pit pics posted soon. Along with our improved views, you’ll be gazing at about 50 miles from our deck on a clear day. There are many great cabins in Beavers Bend. Scores are now owned by cabin management companies and they aren’t vacation homes…they’re rentals. Mountain Vista is truly our vacation home. 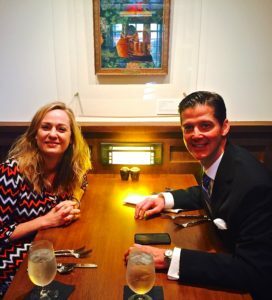 We spend many nights here and are fortunate to have a loyal group of guests visiting multiple times each year. Get our Beavers Bend app for VIP offers. The app also includes my blog and an in-depth breakdown of area attractions near Broken Bow Lake. Sherri and I hope you will visit Beavers Bend this spring or summer and connect with nature. Please, no wagering at the horseshoe pit!